http://flevy.com/blog/wp-content/uploads/2019/01/pexels-photo-872955.jpeg 500w" sizes="(max-width: 300px) 100vw, 300px">Teamwork is essential for businesses of every kind and every sector. Making sure that your team is able to work together smoothly and with minimal workflow interruption is certainly a challenge, especially for those business owners who are used to doing everything themselves. 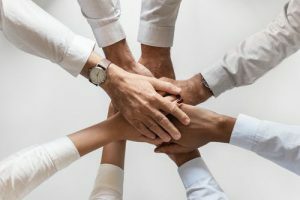 Greater team cohesion will improve your business in many ways, and finding new ways to improve collaboration is the key to better workforce cohesion. If you’re looking for ways to enhance and boost your business management, then cohesion should be the goal. These six tips could be the key to transforming not just your workflow, but the future of your business as well. This isn’t about sales figures and conversion rates (although they can become part of your goals). Having something tangible and realistic to aim for will help your team focus on an end-goal, and encourage them to find ways to reach those goals in the set time. Have targets, and your business will streamline organically. The more diverse your team is, the more skills and experience they bring to the table. Don’t just look for those hires that are experienced in your sector. Look for imaginative and passionate team members that bring new skills and knowledge to your business, and you will grow stronger together. An open plan office has been shown to foster greater ease of collaboration. You could go further than this change though, and opt instead to fully commit to a more flexible coworking space from The Brew. Not only will this make it easier for your workers to use local infrastructure to get to work, but it will also give your business an address that suggests success. City central offices also make it easier to enjoy team-building downtime due to greater access to city centre events. Every member of your team will have those areas that they excel at. Make sure you know what your employees are exceptionally skilled at, and delegate tasks accordingly. Not only will this make the finished output better, but it will also promote a more natural leadership structure that highlights teamwork with specialisation. Being able to communicate between workers is essential if you want better cohesion. Ditch the slow emails and use cloud solutions in their place. Chat tools like Slack, Discord, or Trello are all far quicker and efficient than emails. The better your communication channels, the more efficient your collaborations. There should a process in place that allows for the delivery of feedback. This is two-way feedback and is essential for a more cohesive work environment. Make sure that you celebrate your team’s successes, and highlight in public those team members who have delivered. However, you also need to be open to thoughts on your own leadership. Have open-door times for your team to approach you, and learn from the feedback that you get. There’s no quick way to build a more cohesive team. It takes time and will need constant assessment, especially when new projects come in, or you hire new members of your team. Make sure that you put cohesion at the top of your goals, and your business will only grow stronger as a result.